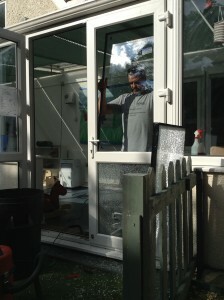 It is a popular misconseption that an installation of uPVC replacement windows and doors puts an end to window maintenance! Yes, timber windows should really be sanded down, painted and varnished annually/bi-annually but Replacement Windows and Doors also need some regular TLC, to ensure they are functioning correctly and that their warranty is still valid! If you read the small print of most order forms it states that, in order to ensure that your 10 year guarantee remains valid, proper care and maintenance needs to be given to your windows and doors. We recommend a cleaning and maintenance schedule as listed below. We often forget that after buying a house, the purchase of windows & doors is the next biggest investment we are likely to make. Over time windows, doors & conservatories will deteriorate without correct maintenance, so by solving problems as they occur you will save money in the long run. We can carry out general maintenance & repairs on windows, doors & conservatories including, fascia, soffits & guttering. We carry out full maintenance inspections to look at all your windows, doors & conservatories in Bury St Edmunds, Suffolk, Norfolk & Cambridgeshire. We can provide a full report on any problems that require professional repair.